New suspension benefits farm/ranch, acreage and home owner's utility vehicle needs. The new 2012 Club Car XRT 1550 4x4 utility vehicle will be available in early August, and brings a totally new suspension system to the market. The semi-independent 4-link rear suspension offers solid-axle strength and independent suspension flexibility for a smoother ride and 15% lighter component weight. The vehicle is rated to carry 1,050 pounds in the bed maintaining an axle clearance of 7.4 inches even on rocky, rough terrain. The XRT 1550 also sports a redesigned brake rotor hub with replaceable bearings and a more durable metallurgy than past models. 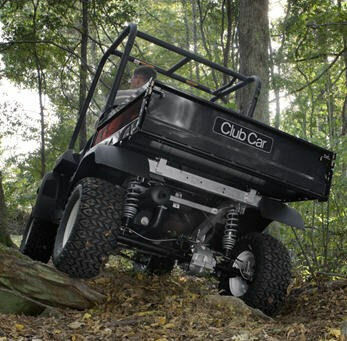 Club Car's new 4-link semi-independent rear suspension system offers a solid axle's strength with independent suspension performance. In the rear, the differential has been redesigned to provide 30% better life expectancy and reduced maintenance frequency. The clutch, too, has been upgraded to provide significantly longer and quieter service. The XRT 1550 is equipped with a true-all-wheel drive IntelliTrak system available with gas or diesel engines in two- or four-passenger models.